Examples of hypertext fiction – how to write hypertext narratives? Looking at examples of hypertext books there are only a handful that have been critically examined. Paul Hackman notes, “fifteen years after the first generation of hypertext novels emerged, hypertext literature remains on the fringe of literary studies” (2011, p. 86). One of the reasons for the lack of hypertext fiction novels, besides the issues with remediation and the phenomenological experience are the technical limitations. 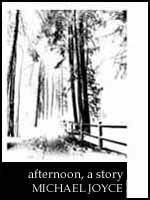 Afternoon by Michael Joyce, published in 1987 by Eastgate Systems, is known as the first hypertext fiction. One of the well-cited examples of a hypertext narrative is Patchwork Girl by Shelly Jackson published in 1995 by Eastgate Systems using Storyspace software. The narrative offers two paths that the reader can move back and forth between, “until finally the narrative settles into a long sequence of lexias, each with only one possible link” (Hackman, 2011, p. 94). Hackman (2011) argues that even as a hypertext book, the story relies on print conventions: “characteristics of wholeness and permanence associated with paper and print, and the materiality of paper as a metaphor for the patchworked body of the creature” (p. 102). Therefore, one of the first-generation examples of hyperfiction does not go too far beyond familiar linear narrative convention of the print book. An example of hypertext fiction that makes more use of the digital medium is M. D. Coverley’s “Califa” which follows the parallel stories of different characters (Mangen, 2008, p. 41). The multiple characters requires the switch of perspectives and so this built-in non-linearity of the narrative fits well with the hypertext medium. As Schneider points out “due to the predominant focus on short-time appearances (or non-chronological presentations) of characters in hypertexts, narratives of gradual psychological development, which have been the trademark of the traditional novel, become all but impossible” (Schneider, 2005, p. 2013). So using the hypertext ‘chunky’ format, requires fundamental changes in the traditional method of storytelling. As Jill Walker (2005) concludes: “perhaps our greatest challenge . . . lies in recognising literary forms that do not adhere to our conventional forms of discipline” (as cited in Mangen, 2008, p. 416). In other words, the new medium calls for new literary forms. In this case, would the hypertext book become more successful if new narrative conventions were established for the digital medium?